Acacia baileyana 'Purpurea' is a small evergreen tree with domed canopy, it is fast growing but short lived (8 - 15 years). This difference between this and the species plant is the colour of the leaves, new growth and young leaves are an attractive reddish purple. It bears pollen rich, fluffy stamens of brilliant lemon yellow colour in June to August depending on latitude and exposure to cold winds. Soil: Will adapt to any soil conditions but does best in well drained soils. Maintenance: Water well during first summer, prune after flowering to keep tidy, feed in autumn with blood and bone. Makes a bit of a mess with its spent blossom - but its worth it for the fabulous display of colour in mid winter. Jocelyn Herrmann - Latrobe valley Vic. 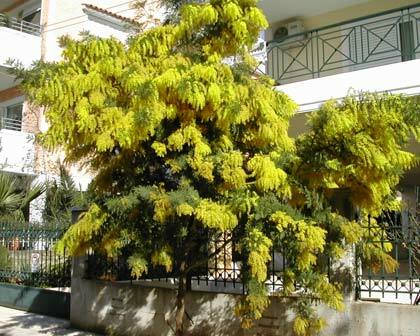 : Is there a prostrate form of the acacia baileyana prurpurea ?. Webmaster - Sydney: You are in luck Jocylene, there is indeed a prostrate form and there is a link alongside here (in Plant Marketplace) to the Sydney Wildflower Nursery, where David will help you if you send him a query..
Sam - Cheltenham, Victoria: Hi there, Can you recommend any wholesale nurseries that stock this Acacia? I am having trouble finding it. Thanks! Sam. Webmaster - Sydney: Hey Sam, swivel eyes a little to the right and up a bit. See 'Plant Marketplace" ? We are not wholesale but we do sell it in tubestock size. Just click on the button 'Take me to the shop now" and presto, question answered..
Clare Taylor - North Coast, NSW: Help please. My purple cootamundra has been in the ground for about 6 months. Unfortunately it does not seem to be growing well and the foliage is quite yellow at the bottom of the stems. The soil is fairly heavy clay. What can I do? Thanks in advance for your advice. Clare. Annie - Webmaster: Acacia baileyana 'Purpurea' will grow in most soils but prefers well drained soil. Poor drainage can be a problems with clays soils, symptoms of poor drainage include thinning of the tree canopy and yellowing of the older leaves. You can try adding organic matter to the soil, this will slowly begin to improved the soil ability to drain. Unfortunately, most ways of improving drainage need to be done before the tree is planted. These include digging of drainage ditches or raising the soil level either by mounding the soil or creating a raised bed. It is also important to place the plant in soil above the subsoil to ensure good drainage. If the soil is draining well, I would check the pH of the soil. 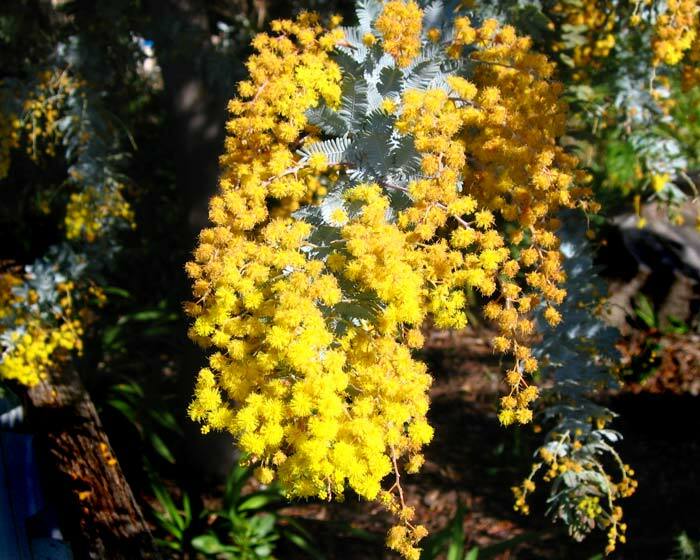 Soil that is too acid or alkaline can affect the plants ability to take up nutrients, yellowing of the leaves can indicate low nutrient levels..
Jennifer - Kilsyth: Would like to buy a more advanced tree than tubestock, to replace a wattle that had passed its prime. Any outlets near us?. Webmaster - Sydney: Hey Jennifer, Gardenarium (as listed in next column) are your best bet, they ship to Victoria from their base in SA, just next door..
Michelle Neumann - Bass Coast: Hi I have an amazing purple wattle that has taken off extremely well in my backyard, next to a neighbouring fence. Are the roots invasive? Should I control this tree with pruning or will i have to (should) remove it in the next few years. It's only 18 mths old and is as tall as the neighbours roof already but hasn't branched out or thickened much yet..
Annie - Webmaster: As you have found it is a very fast growing tree. It will grow to about 8m tall and can spread to 6m wide. You could prune it but you will loose the lovely spreading shape. These trees are comparatively short lived, living for 10-15years. All roots will spread away from the trunk and if planted close to a fence into your neighbour's garden but these are not known to cause major problems. Pruning a tree will always spoil its shape so if the tree is going to end bigger than you wanted it is probably worth removing in now and planting a tree that better fits your requirements..